Today at 6:00, I was awakened by Mom saying to wake up because we're (Christian, Paddy, and I) leaving at 7:00 with the Beardsleys. Why? The rally in Fairfax of course! Gov. 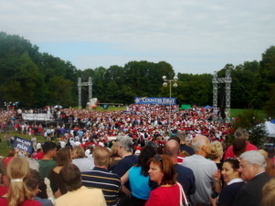 Sarah Palin and Sen. John McCain were going to be speaking in VA's own Fairfax county and I got to watch!! How cool is that? After stopping at Sheetz to meet some friends, driving through a mix of people trying to get to work and people trying to get to the rally, finding a parking spot next to McDonalds, walking to get to the end of an mile and a half long line, and going through security, we were finally there! And so were around 15,000 other people. The excitement, the Republicans, and of course the noise/shouting (not to leave out the protesters)! Mackenzie and I went over to the fence near the bathrooms and there almost right in front of us was her! Mother of five, pro-life supporter, and beautiful Gov. 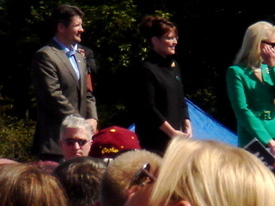 Sarah Palin getting ready to walk up on stage with Sen. McCain. We ran back over to our group and started chanting the same tune as everyone else. SARAH, SARAH, SARAH. 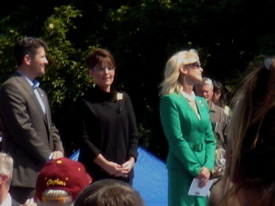 Then she came out followed by our next president, Cindy McCain, and Todd Palin! Everyone started shouting and waving signs (Mine saying Homeschoolers for McCain and Palin). It was an AMAZING day! Was it worth waking at 6:00? YES!